The Full of Joy Yoga 20 hour teacher training for teaching kids ages 2 – 11 years is geared towards teachers, parents, caregivers, OT’s, PT’s, yogis, and everyone who loves working with children. This training is interactive and comprehensive and will help to inspire you to bring out your inner yogini. This training incorporates music, stories, games & props in a fun and exciting way that will engage any child from toddler through 6th grade. Participants must have at least 1 year of yoga class experience. Why Yoga & Mindfulness for Kids? Research on school-based yoga and mindfulness suggests that these programs may have a number of positive effects on student health, behavior, and performance. Yoga 4 Classrooms has compiled this list which outlines some of the benefits of school-based yoga and mindfulness practices that address the whole child, thus maximizing the development of academic, social and emotional competence in addition to benefits for teachers and classroom climate. How to develop your own classes that are fun, safe, effective and engaging for kids ages 2-11 years (pre-K to sixth grade). Child development as it relates to 2 to 11 year-olds. Background on mindfulness and using child-friendly terms to describe how it affects the brain. How to create your own mindfulness moments using the Mindful Yoga Breaks® 6 tools. How to develop different behavioral management techniques that support a loving, non-competitive environment. How to teach with confidence. Observe and assist a real kids yoga class! What’s next? Marketing your own kids classes – further opportunities to take The Biz of Kids Yoga Course with Lani. Join the private FOJY fb group to share ideas with other FOJY graduates. The training is generally held on a Sat & Sun but hours will depend on the host studios schedule. There will be short breaks throughout, as well as breaks for lunch or dinner with local eatery suggestions available. Lani will provide light snacks, but bringing your own to share is always appreciated! If you are a registered Yoga Alliance Yoga Teacher, the Full of Joy Yoga 20 hour training can be used for your Continuing Education contact hours.Continuing Education Units (CEUs) and/or Professional Development Points (PDPs) may also be available through your employer. It is your responsibility to confirm with them ahead of time! If you are a teacher in CT- please check out CT Charts-A-Course for their scholarships that pay for trainings like mine! If you teach in Branford, CT, you can qualify for scholarships through the Branford Early Childhood Collaborative. If you are an early childhood educator in NY, you may be able to get a grant through The Aspire Registry on the New York Works for Children website. 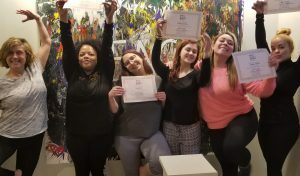 $525 FOJY graduate & teacher discount/$545 earlybird/$625 regular rate which includes a teaching certificate, a teaching manual, Lani’s FOJY kids yoga book, Mindful Yoga Breaks® Card Deck and multiple opportunities to observe, assist or teach yoga classes in CT schools with Lani Rosen-Gallagher. Payment plans are available. You can register for an upcoming training here. For trainings that are paid directly to Lani & Full of Joy Yoga, a refund will be issued within 2 weeks of a teacher training. FOJY will take $75 for registration, supplies and processing. Payments from cancellations may be applied to another upcoming teacher training within 1 year. Cancellations within 2 weeks of the training are non-refundable. When paying for a training to a yoga studio, the studios cancellation policy will apply. Studios looking to host a Full of Joy Yoga Kids Yoga Teacher Training can contact Lani directly. Lani, you are a magical being, from every ounce of my spirit I thank you for sharing you insight, knowledge and euphoric energy. Thank you thank you thank you! Here’s to another step on this yogic journey. Lani, you are so good at what you do! thank you for sharing it all with us. I loved all of it, the creativity in all the poses, games, etc. Your teaching style- inviting, warm, playful. perfect combination! I loved feeling like a community of women after just one weekend. Also, realizing yoga can really be told like a story. Seeing the kids do yoga got me so excited to do this! We covered a lot in the 20 hours and what we covered was amazing and so useful. The training was all interesting and helpful for me. I feel like it was totally appropriate and met all of my needs. I found the training to be full of inspiring and creative ideas. Lots of things to explore and more then enough tools to use when planning a class. I thought it was great! Was such a nice training to have after the 200 hour. I like the intimacy of the group and how comfortable I felt with everyone. Thank You! I learned so much and am excited to incorporate all of the tools/ideas from the weekend.